A/B testing is crucial for video marketing. Using this tool, marketers can test a number of videos at a time and decide what works best for their strategy. A/B testing also helps to increase traffic. 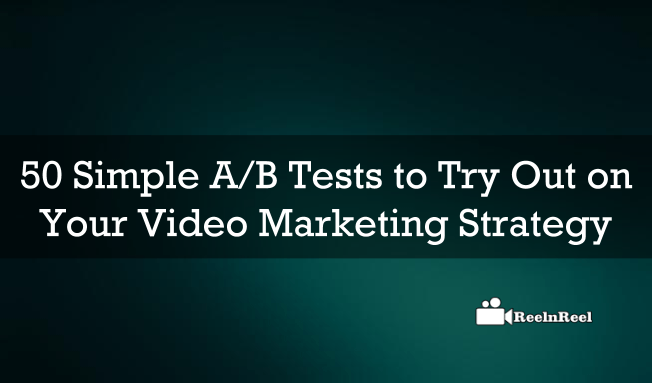 Here are few A/B tests to carry out to make sure that right video marketing strategy is used. 1. Trying different titles for the video is helpful to determine which title attracts the audience. 2. The title can be specific or generic. 3. Thumbnail captures the attention of the viewers. Try different thumbnails for the video and measure the effect. 4. A/B test with the automatically generated thumbnail and the one created by you. 5. Add text to thumbnail or have a close up of the product and see what difference it makes. 6. When having the video on the webpage try positioning it in different places. 7. Test the conversion rate by changing the length of the video. 8. Make two different types of introduction videos and find which of them amuse the audience. 9. Another crucial A/B test is to check whether to opt auto play mode or manual video play mode. 10. Try two different styles such as animation style and live video and see which works better. 11. To check which platforms assures maximum viewership try uploading the video on YouTube and also self-host it. 12. Using A/B testing try two videos with different voice overs, colors and music. 13. Another A/ test for video is to change the metadata and see how the viewers react. 14. Try testing the video on the landing page as well as on the website. 15. Try different colors, text, size and font for the text in the video. 17. Try different places for the call to actions. 19. Run the A/B tests for longer to get more confidence. 20. Do not stops monitoring the performance and continue to try A/B testing. 21. Some seasonal periods may bring changes to the performance of the video and so it is necessary to test at the right time. 22. Track the key performance indicators. 23. Try calls to action with different words. 24. Also, change the colors of the calls to actions and A/B test them. 25. Try different sizes of buttons for the calls to action. 26. A/B test the calls to actions by using pop-outs or placing a link. 29. The font size on the landing page copy is another thing to A/B test. 30. Use different headline copies. 32. Use professional images and also causal images and see the difference in response. 33. The fonts used on the landing page are also important. 34. Test the sale of the product by offering free delivery and charged delivery in different videos. 35. Try to promote a product or service with video informing about different offers and discounts. 37. A/B test which graphics and color schemes are attracting the viewers more. 38. A/B test whether to use music or commentary in the video. 41. Try including sales videos as well as informational videos and see which of them are more effective. 42. For Facebook video marketing strategy, use two videos to the same target group and test the percentage of views. 43. Try auto play mode and manual play mode for the videos uploaded to Facebook and see the impact. 44. For Twitter video marketing strategy, the A/B testing is similar to that of Facebook but the video length should not be more than 30 seconds. 45. The limit of video length for Instagram marketing is fifteen seconds and test two versions of videos of this length and choose the best performing one. 46. A/B test the YouTube videos by showing two types of ads. 47. Also A/B test a landing page with or without a video and see the conversion rate. 48. Have your video with and without subtitles and see what difference it makes. 49. Test the views rate and conversion rate with giving different offers to the video viewers. 50. Include sales copy or the product description in the email video marketing and test. A/B testing is not a one-day affair. It has to be continued for few weeks based on the traffic one gets. It is worth continuing the test as this gives an opportunity to figure out the best marketing strategy for your business.